Yesterday, Apple has released iOS 5 for iPhone 4S, iPhone 4, iPhone 3GS, iPod touch 3G, iPod touch 4G and iPad with more than 200 new feature. One of this new features is iMessage. First of all, iMessage and Messages are not seperate apps, iMessage is integrated in Messages. 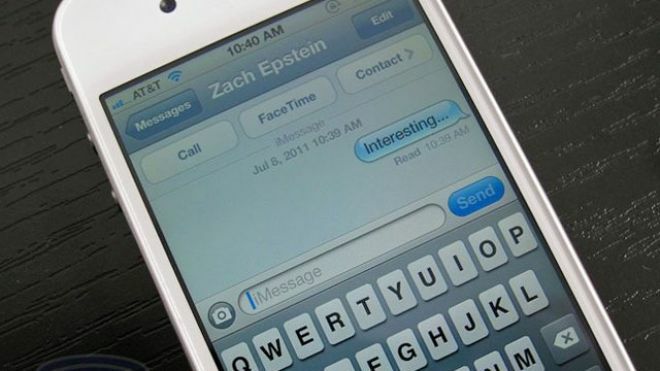 iMessage is a new messaging service for all iOS 5 users. iMessage allows you to send free and unlimited text messages via Wi-Fi or 3G (or EDGE) from iPhone, iPod Touch or iPad to anyone with one of those devices that runs iOS 5 or above. How to use iMessage ? iMessage is built into the Messages app, so you can send text, photos, videos, locations and contacts. iMessage is like BBM in BlackBerry. Keep everyone in the loop with group messaging. iMessage also let you track your messages with delivery receipts and optional read receipts, see when someone’s typing. If any message can’t be sent via iMessage, it sent automatically using SMS service. Unregistered users’ names in iMessage appear in red color. This entry was posted in iPad, iPhone, iPod and tagged imessage, ios5, ipad, iphone, ipod touch. Bookmark the permalink.